JANUARY 2014 • FOODSERVICE EQUIPMENT & SUPPLIES • 11 Bonanza and Ponderosa Serve Up New Design and Menu Options Homestyle Dining unveiled plans for a brand refresh and culinary revitalization for its Bo- nanza Steakhouse and Ponderosa Steakhouse (seen here) concepts as the company plans to renew its emphasis on franchise growth in the United States and internationally. Beginning early this year, both family-focused dining chains will ofer expanded menu oferings on the food bar and across their entrée line-up in addition to updated interiors that represent a departure from their previous Western theme. The design will feature a completely new menu board with digital displays, making for a brighter and fresher presentation. The refreshed inte- riors will also include a refurbished and redesigned food bar area with new eco-friendly plates. 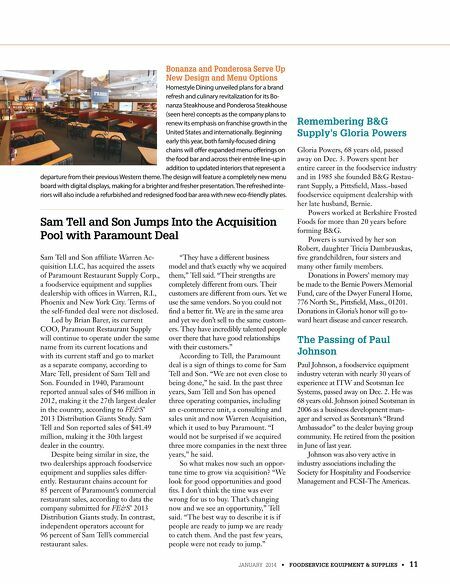 Sam Tell and Son affiliate Warren Ac- quisition LLC, has acquired the assets of Paramount Restaurant Supply Corp., a foodservice equipment and supplies dealership with offices in Warren, R.I., Phoenix and New York City. Terms of the self-funded deal were not disclosed. Led by Brian Barer, its current COO, Paramount Restaurant Supply will continue to operate under the same name from its current locations and with its current staff and go to market as a separate company, according to Marc Tell, president of Sam Tell and Son. Founded in 1940, Paramount reported annual sales of $46 million in 2012, making it the 27th largest dealer in the country, according to ' 2013 Distribution Giants Study. Sam Tell and Son reported sales of $41.49 million, making it the 30th largest dealer in the country. Despite being similar in size, the two dealerships approach foodservice equipment and supplies sales differ- ently. Restaurant chains account for 85 percent of Paramount's commercial restaurant sales, according to data the company submitted for ' 2013 Distribution Giants study. 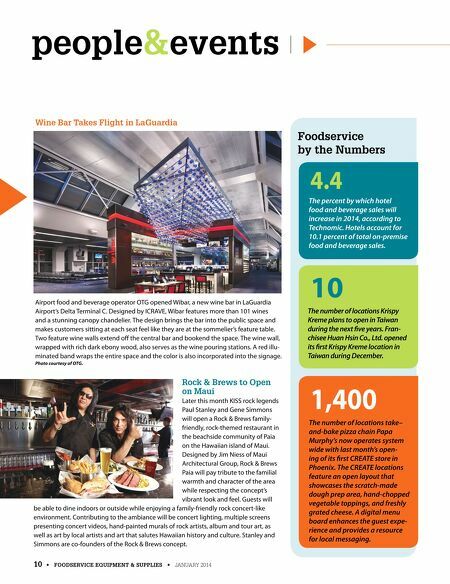 In contrast, independent operators account for 96 percent of Sam Tell's commercial restaurant sales. "They have a different business model and that's exactly why we acquired them," Tell said. "Their strengths are completely different from ours. Their customers are different from ours. Yet we use the same vendors. So you could not find a better fit. We are in the same area and yet we don't sell to the same custom- ers. They have incredibly talented people over there that have good relationships with their customers." According to Tell, the Paramount deal is a sign of things to come for Sam Tell and Son. "We are not even close to being done," he said. In the past three years, Sam Tell and Son has opened three operating companies, including an e-commerce unit, a consulting and sales unit and now Warren Acquisition, which it used to buy Paramount. "I would not be surprised if we acquired three more companies in the next three years," he said. So what makes now such an oppor- tune time to grow via acquisition? "We look for good opportunities and good fits. I don't think the time was ever wrong for us to buy. That's changing now and we see an opportunity," Tell said. "The best way to describe it is if people are ready to jump we are ready to catch them. And the past few years, people were not ready to jump." Sam Tell and Son Jumps Into the Acquisition Pool with Paramount Deal Remembering B&G Supply's Gloria Powers Gloria Powers, 68 years old, passed away on Dec. 3. Powers spent her entire career in the foodservice industry and in 1985 she founded B&G Restau- rant Supply, a Pittsfield, Mass.-based foodservice equipment dealership with her late husband, Bernie. Powers worked at Berkshire Frosted Foods for more than 20 years before forming B&G. Powers is survived by her son Robert, daughter Tricia Dambrauskas, five grandchildren, four sisters and many other family members. Donations in Powers' memory may be made to the Bernie Powers Memorial Fund, care of the Dwyer Funeral Home, 776 North St., Pittsfield, Mass., 01201. Donations in Gloria's honor will go to- ward heart disease and cancer research. The Passing of Paul Johnson Paul Johnson, a foodservice equipment industry veteran with nearly 30 years of experience at ITW and Scotsman Ice Systems, passed away on Dec. 2. He was 68 years old. Johnson joined Scotsman in 2006 as a business development man- ager and served as Scotsman's "Brand Ambassador" to the dealer buying group community. He retired from the position in June of last year. Johnson was also very active in industry associations including the Society for Hospitality and Foodservice Management and FCSI-The Americas.